After years of research, development and golf swing analysis, the engineers at Tour Angle identified the optimal forearm to shaft angle (Tour Pros consistently average 144º), which led to the development of the Tour Angle 144. The Tour Angle 144 is designed to identify and fix the most common swing flaws, as well as teach a golfer to develop one fundamental golf swing. The Tour Angle 144 encourages perfect posture, a one-piece takeaway, and trains you to delay the release of the club until impact. Now you can achieve this fundamental angle and work on your swing in a natural and unforced way with the TOUR ANGLE 144! "I did find the Tour Angle 144 useful in reinforcing a good set-up posture and it was valuable for ensuring a ‘one-piece’ takeaway. Aside from the actual training aid itself, I really felt like the DVD with Top 100 instructor Steve Bosdosh was a great addition. It adds a great deal of value to the training aid; not only for the instruction on how to use the product, but for some valuable swing tips. In all, you have a pretty nice package and it’s one that I think people looking for some consistency – both in their set up and takeaway – could benefit from." "As far as training aids go this is one of the more innovative products that I have used. It is very easy to use and can be done while hitting balls which I think is always critical when using a new device. I really liked that the Tour Angle 144 focused on many different facets of the game like set up, backswing, downswing, and even chipping." "With it, chipping fundamentals were reinforced. Posture and stance was reinforced. Positions of the golf swing were reinforced. Impact felt natural and proper. I was hitting the ball solid. The immediacy of the feedback was a special factor. It didn’t require goofing around with the tool to see results. I just had to use it!" GIVE IT A RISK-FREE TEST-DRIVE FOR A FULL 30 DAYS! 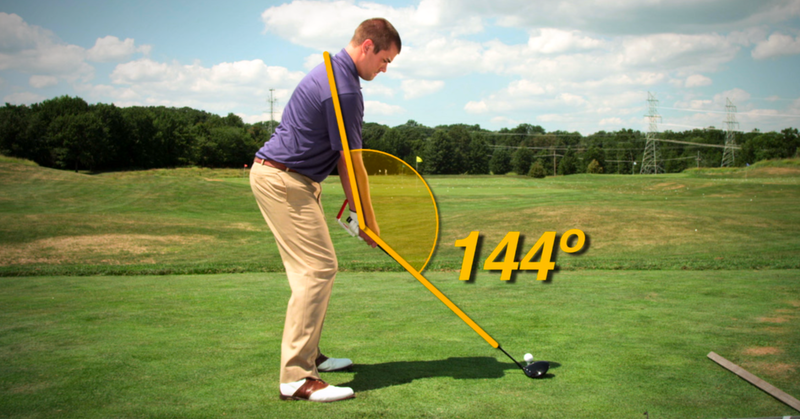 If you put the Tour Angle 144 into practice you’ll immediately improve your swing. 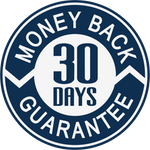 We believe that so strongly that we're going to give you a completely no risk, 30 day guarantee. If you’re not happy with it for any reason return it in 30 days. There is no risk on you whatsoever. ORDER THE TOUR ANGLE 144 NOW! Select your Tour Angle 144 variant below (For Right or Left Handed Golfer) and click BUY NOW. Your purchase comes with 30 Day Money Back Guarantee! After clicking BUY NOW you will be taken to the Birdie Town secure checkout page to complete the purchase. "Very easy to use, the DVD answers any questions regarding correct use. I'm impressed with the number of improvements the aid facilitates. Setting the grip closer to the roots of my left middle fingers set the club handle more under the heel pad and lengthened my left thumb. I'm able to maintain a secure hold with less tension. Perhaps the most impressive aspect is how it promotes consistent posture over the ball with every club. Knowing that I have a reliable and consistent setup promotes confidence. My takeaway is freer and more upright, allowing the club to drop in better on the downswing. I recommend the Tour Angle 144 to any golfer seeking improvement." "I never take the time to write a review on anything, but I just had to share. The tour angle 144 might be the best device I have ever used to teach the short game. It's easy, instant feedback and fits in your back pocket. I carry a +3 Handicap, Won the club Championship Match play at TPC Sawgrass and 2X club Champion at Deerwood Country Club, winning by at least 10 both years, and this thing has made my game better! It made practicing my short game fun again!" "I was a 12 handicap and I've drop 2 strokes in 2 months Thanks to your product. I can't thank you enough for such a great product. The Tour Angle 144 gives me a good starting point for my swing." "Are you kidding. I can't live without it. On the course I take practice swings before every shot. In the house I practice all the time. The tool has really helped especially when used with my Tour Sticker. My favorite tool by far." "I feel like it really helped me get a better path with my swing and embed good muscle memory and swing thoughts. My best shots have been when I maintain that good angle. I try to take a few practice swings with it inside every few days." "It was an amazing revelation to see how long you have to hold the angle through the swing process. The TourAngle144 showed me that. Cured my occasional duck-hook." "This thing is amazing. When I put it on I hit the ball straight every time. "I like to swing it in backyard in between trips to the course. I believe it has really taught me the right takeaway which was lost on me for some reason. Good product!" "I am a player that is a feel player and like the feel feedback I get with the 144. The product has helped me in 3 key areas: 1) It helps me settle into the correct posture. I let my arm hang naturally and set up to the ball with perfect repeatable posture every time. 2) I can feel the 1 piece takeaway and that has improved my tempo. 3) It has helped with my chipping where I use body rotation to control the chip shots not the wrists. The 144 is great." "Love it. I was diagnosed with a severe case of "The Hands" as my Pro put it. As an X Tennis player, I was having a very difficult time with left pulls. Tour Angle 144 helped me tremendously to help stop turning my wrists over, and get my swing on the correct path. I have purchased many products, that were supposed to help fix something, that turned out to be more gimmick, than guide. Tour Angle 144 actually helped tremendously. I keep it in my bag, and use it to warm up with before each round. Thanks"
© 2018 Birdie Town. All right reserved. All Tour Angle 144 purchases through the shop.birdietown.com website can be returned within 30-Days of receipt of product for any reason less shipping and handling. All returns are the responsibility of the customer. The customer must reach out to info@birdietown.com to gain a return authorization. The return must be in the original box. Once the return is inspected by the company within 30 days of customer receipt of the product (date stamped from shipping carrier on delivery slip), the company will issue a full refund within 5-10 business days. The refund will be issued on the credit card on file.